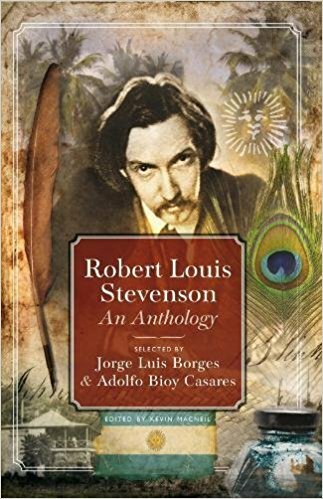 Robert Louis Stevenson, Jorge Luis Borges and Adolfo Bioy Casares have more in common than membership of the subset of writers who use three names: both Borges and Casares were admirers of their predecessor and had included ‘Faith, Half-Faith and No Faith at All’ in Extraordinary Tales. This fable was also to be included in an anthology of Stevenson’s work which they planned and hoped to translate and publish. Unfortunately those plans never came to fruition, but now, thanks to Kevin MacNeil, we can finally read their selection, if only in English. The Anthology cannot be described as the perfect introduction to Stevenson as it contains nothing of his most famous works – neither of his bona fide classics, Treasure Island and The Strange Case of Dr Jekyll and Mr Hyde, are represented, nor is anything of his historical novels, such as Kidnapped. Instead we have a selection of his essays, one of his best known short stories (‘The Bottle Imp’), ‘The Suicide Club’ (from New Arabian Nights) and a selection of fables. The Anthology’s second half is filled with Stevenson’s fiction, from his earliest (‘The Suicide Club’ published in 1883) to his latest (‘The Bottle Imp’ from 1893). (As the dates demonstrate, Stevenson’s writing life was brief) The former is written very much as entertainment despite its dark premise, with an emphasis on breathless plotting and central characters who are self-consciously heroic. The latter, despite its supernatural premise, is more ‘believable’, Stevenson having developed his ability in ‘realism’ without losing any of his skill in constructing a story. Both noticeably, though in different ways, grapple with moral issues, as do the seven fables that follow (from the posthumously published Fables), brief stories which make a moral point, written in the style of tales or legends. The Anthology provides a welcome reminder, not only of Stevenson’s range, but of the regard he was, and is, held in by other writers. Though his work is now widely available electronically, critical editions from respected publishers of ‘classics’ are not. If you want to buy his complete short stories you will have to buy an American edition. 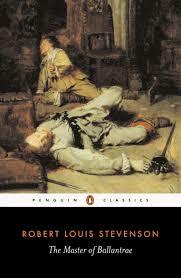 Luckily Robert Louis Stevenson Day provides an annual opportunity to read his work – one that everyone should take. A chance of escape arises when Davis is given the opportunity to captain the schooner Farallone, with its cargo of champagne, to Sydney, smallpox having taken its toll on the original crew, and with no-one else willing to take up the task. Davis invites Herrick and Huish to join him despite their lack of sea-going experience, revealing that, far from taking the cargo to its intended port, he plans to sail for Peru and sell it, before taking the schooner for himself. Herrick is reluctant (“I’ve not fallen as low as that”) but eventually agrees. Stevenson skilfully uses the changing dynamics of the trio’s relationship to keep tensions high throughout the novel. Davis puts his proposal to Herrick before inviting Huish and appoints him First Mate, but, once on board, Huish decides to begin drinking the champagne and Davis soon joins him in permanent drunkenness leaving Herrick isolated. In moral terms (and Stevenson is always a moral writer), Herrick’s conscience continues to bother him, Huish’s bothers him not at all, and Davis vacillates between the two. His personal island, and the calm manner in which he discusses his brutality, make him seem like a prototype Bond villain. In the end, Herrick must choose between Attwater and Davis, a choice which is almost literally between the devil and the deep blue sea. The Ebb-Tide has the adventure of Treasure Island but without the heroism. Instead we see the moral complexity which characterises Stevenson’s most memorable creations, Silver, and, of course, Jekyll and Hyde. Our colonial adventurers are portrayed as, at best morally confused, at worst, morally bankrupt. “Don’t think me a philanthropist,” Attwater tells Herrick, “I dislike men, and hate women.” It is difficult not to see the disease which permeates the novel (Attwater’s island has also lots most of its inhabitants to smallpox) as representative of colonialism. However, The Ebb-Tide with its (to quote Stevenson again) “ugliness and pessimism” also seems one of his most modern works, and a sad reminder of what he might have gone on to produce. 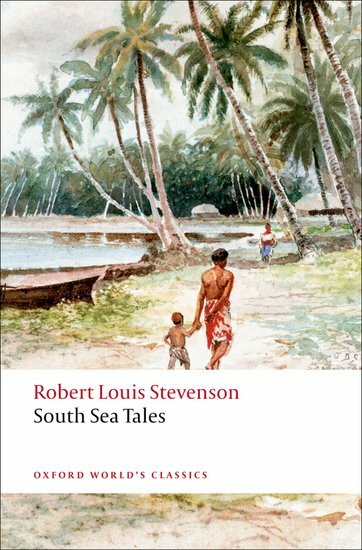 Today, as you may or may not know, is Robert Louis Stevenson Day – the author of, not one, but two tales which have buried their way into the popular imagination (Treasure Island and The Strange Case of Dr Jekyll and Mr Hyde ). As for the rest of his work, however, Kidnapped aside, it is far less read – and has, at times, fallen out of print as well as out of favour. It’s true that he probably didn’t aid his partnership with posterity by writing in so many genres – including both fiction and poetry for children – and by co-authoring three of his novels with his stepson, Lloyd Osborne. Two others were left unfinished at his relatively early death. Only recently has he begun to be re-evaluated, perhaps in response to the love so many other writers have for his work. The Master of Ballantrae, written in 1889, contains many of the elements familiar from his two most famous books: pirates, sea voyages, exotic locations (though ostensibly a Scottish novel, we are transported to both India and America) and an initially straight forward but increasingly ambiguous battle between good and evil. In The Master of Ballantrae this takes the form, not of a divided individual, but of two warring brothers. The reference to the Biblical story of Jacob and Esau is appropriate as James has just rather impulsively given up his birthright (the inheritance of his father, Lord Durrisdeer’s, title) should the Pretender’s uprising fail. When the decision is made that it will be James who goes to war, Alison (the woman he is to marry) throws the coin “clean through the family shield in the great painted window,” a breach which is never repaired. Eventually an Irish soldier, Colonel Burke, brings news of James – he is in France and in need of money. From that point on, the Master cannot be shaken off – like the bad penny which decided his fate, he will always reappear, tormenting Henry in any way he can. The story becomes one of James’ persecution of Henry, and Henry’s attempts to free himself of it. Stevenson is excellent on the increasing tension within the family. The novel includes a number of set-pieces which even now might make the hairs on the back of your neck stand up. The Master is a wonderful character – I did wonder whether the term was synonymous with the devil (though I can’t find any evidence of this) as there is something satanic about his pursuit of Henry. Utterly without scruples, he is also dangerously charismatic, so much so that even the Mackellar, the servant who tells much of the story, and a strong partisan for Henry, feels his charms. In contrast, Henry can seem rather dull – but as that is how other characters perceive him to his disadvantage, Stevenson may be intentionally placing the same temptation before the reader. Wherever the Master goes he gains loyal followers – but will sacrifice them without a thought when necessary. As the novel progresses, however, it is who is Henry is increasingly changed, becoming intent on his own revenge; in this we see the moral issues which Stevenson always puts at the centre of his adventures. The Master of Ballantrae may not have lasted in the popular imagination like Treasure Island and The Strange Case of Dr Jekyll and Mr Hyde, but in some ways it is all the better for that as the reader does not approach it with familiarity. Anyone looking for ‘A Winter’s Tale’, as it is subtitled, with suspense, shock, adventure and intrigue, will find it here. You are currently browsing the archives for the Robert Louis Stevenson category.